The do not a lot approach to climate change came under question on revelations that the Great Barrier Reef would be only a remnant within 50 years on even optimistic assessments. The tourism operator taking his clients way beyond the Great Barrrier Reef and deep into the Coral Sea in 2002 was certainly going to great lengths for the pristine reef experience. The tourists though were hardly happy when the reef turned out to be 90 percent bleached coral skeletons down to a depth of 30 metres. They claimed misrepresentation and talked of calling for a lawyer. Welcome to the Australian tourism industry's worst nightmare. It doesn't matter whether you are surveying the well-heeled globetrotter or the fruitpicking backpacker, Australia's premier tourist attraction is the Great Barrier Reef. But after millions of years in the making, it is now under extreme threat from a process we have known about for less than 20 years. The Great Barrier Reef has been called the largest living organism known. In fact, the key to the reef is two organisms, both tiny: a coral polyp that provides a house and a zooxanthellae that lives there, photosynthesizes away and feeds the polyp. Coral bleaching occurs when the polyp expels its tenant and if the relationship is not resumed in some reasonable time frame, the coral dies. In the mid-80s, a young Australian doctoral student then at the University of California first suggested that the mysterious relationship breakdowns might have something to do with water temperature. Yesterday's heresies are today's orthodoxies and Professor Ove Hoegh-Guldberg is now director of the University of Queensland's Centre for Marine Studies and heads up an international study on reefs and climate change for the World Bank and Unesco. With his father, economic forecaster Hans Hoegh-Guldberg, he is now pioneering studies of the biological, economic and social effects of coral bleaching. Global conservation group the World Wide Fund for Nature and the Queensland Tourism Industry Council (QTIC) commissioned The Implications of Climate Change for Australia's Great Barrier Reef and much of the money was put up by the Federal and Queensland governments. After two years and forensic review by specialists covering a broad range of fields, the 350 odd page report on the Great Barrier Reef is to be released world wide today. The findings are shocking. The reef is headed for major damage regardless of what we do and the communities, natural and human, that depend on it will also suffer major shocks and losses. Professor Hoegh-Guldberg and representatives from the QTIC and WWF representatives flew to Canberra this week to conduct some quiet briefings in the corridors of power and influence. 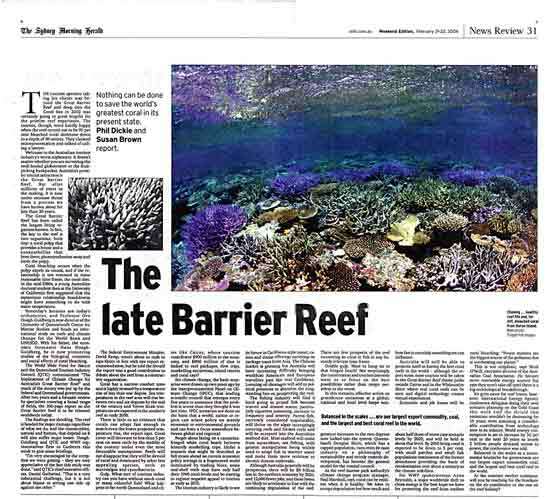 Federal Environment minister Dr David Kemp wasn't about to rush to sign Kyoto in line with one report recommendation, but he told the SMH the report was “a good contribution, from a constructive organisation, to the debate on a major issue for the reef”. It is the biology that is most certain and most disturbing. Coral has a very narrow comfort zone and is highly stressed by a temperature rise of less than one degree. Sea temperatures in the reef area will rise between two and six degrees by the end of the century and “Torres Strait temperatures” are expected in the southern reef as early 2030. Gulp. What sort of tourism industry can you have without much coral or many colorful fish? What happens to far north Queensland and cities like Cairns, where tourism contributes $900 million to the economy and $800 million of that is linked to reef packages, dive trips, snorkeling excursions, island resorts and coral cays? For climate change, the basic scenarios were drawn up two years ago by the Intergovernmental Panel on Climate Change (IPCC), that peak scientific council that emerges every five years to announce that the problem is worse than they thought it was last time. IPCC scenarios are done on the basis that a world, nation or region can orient policy on mainly economic or environmental grounds and can have a focus somewhere between global and regional. Forget about lazing on a casuarina fringed white coral beach between leisurely snorkelling trips and choke on this future. Under a scenario that might be described as full steam ahead on current economic policy settings in a fragmented world dominated by trading blocks, some mid-shelf reefs may have only half their 1990 coral levels and “be starting to register negative appeal to tourists” as early as 2015. The tourism industry is likely to see its future in “Caribbean style” resort, casino and cruise offerings surviving on package tours from Asia. The Chinese market is growing but Australia will have increasing difficulty bringing wealthier American and European travellers past the real Caribbean. Looming oil shortages will add to political pressures to abandon the long standing ban on prospecting the reef. The fishing industry will find it hard going as prized fish become scarcer and disease scares, particularly ciguetera poisoning, increase in frequency and severity. Parrot fish, currently considered unpalatable, will thrive on the algae increasingly covering reefs and former reefs and will be accepted into the Australian seafood diet. Most seafood will come from aquaculture not fishing, with genetic manipulation being widely used to adapt fish to warmer water and make them more resistant to chronic disease outbreaks. Although Australia generally will be prosperous, there will be $8 billion less and 12,000 fewer jobs in the northern economy by 2020 and these losses are likely to accelerate in line with the continuing degradation of the reef. There are few prospects of the reef recovering its coral or fish in any humanly relevant time frame. Double gulp. Want to hang on to that fringed beach? Not surprisingly, the conservation and tourism interests want us to focus on the best possibilities rather than resign ourselves to the worst. In this scenario, effective action on greenhouse emissions at a global, national and local level keeps temperature increases to the two degrees now locked into the system. Queensland’s Douglas Shire, which has capped population, runs even its cane industry on a philosophy of sustainability and strictly controls development, has become the general model for the coastal council. Coral is badly battered by bleaching events, but as the GBRMPA climate change program manager Paul Marshall says, coral “can be resilient when it is healthy - we have to accept degradation but how much and how fast is certainly something we can influence”. The moves which started in earnest in 2003 to control coastal catchment water quality and dramatically increase reef protected areas pay off big time as the mid reefs take until 2030 to drop to half their 1990 coral cover. Economic and job losses are about half worst case scenario levels by 2020, and are held at about that level. By 2050 living coral is down to five percent with small patches and small fish populations “reminiscent” of the former abundance providing the basis of recolonisation over about a century as the climate stabilises. For WWF spokesperson Anna Reynolds a major worldwide shift to clean energy “is the best hope we have for protecting the reef from endless coral bleaching. Power stations are the biggest source of the pollution that is overheating our planet." “Too simplistic,” said an exasperated Mark O'Neill, Executive Director of the Australian Coal Association. O'Neill favours “more renewables” but says they won’t take off until a big technological breakthrough on the storage front. Balanced in the scales as a monumental headache for government are our largest export commodity - coal and the largest and best coral reef in the world. As the summer swelter continues, will you be reaching for the brochure on the air conditioner or the reef holiday? A news/feature package in the Sydney Morning Herald and a news article in the Age was the worldwide break on this shocking new report, followed by 140 wire services, news networks and English language outlets around the globe in the subsequent 48 hours. With some interesting variations, including the Chinese report the reef "would be destructed", the 24 hour delay in the news travelling across the India Pakistan border (or cyberborder?) and the transformation of Australian Environment Minister Dr David Kemp into a an official speaking a day later on condition of anonymity.